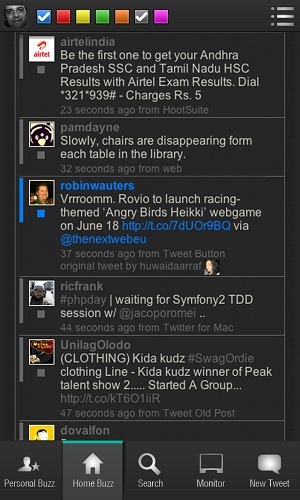 Twimbow, which is a popular and colourful web application for Twitter that simplifies by allowing you to color code different users and more, has announced that its first mobile app for users would land up on the upcoming BlackBerry 10 smartphones. Until now Twimbow is only available for access via the web which could make its users a bit dependant on other Twitter clients when they wish to access it from their smartphones. But not anymore! The app would land in the App World as and when the BlackBerry 10 OS and devices are made available. BlackBerry 10 is the most open OS available for smartphones, way more than Android (and capable of running Android apps as well). The set of tools developers can use is incredible and you can basically port any app to that OS very easily. BB10 is capable of running an HTML5 app as a native app, with a deep integration with the OS (notifications, BBM integration, UI etc.) and taking advantage of the real multi-tasking capabilities of the BB10 OS, something not available in other smartphones. Some of the countries that are very important for Twimbow are historically very important for BlackBerry as well. An example? Indonesia, #2 country in terms of Twimbow registered users and now #1 in terms of daily users. The app is still under development and for now looks like in the picture above but then, the final version would definitely have loads of changes. Also catch the app in action on the BlackBerry 10 Dev Alpha device in the video below.